You may have heard about content strategy, but what is it? And how does it look in the real world? It’s a new area of practice in the learning industry, and it’s bound to change how all of our work gets done. Want to get introduced to this powerful new concept? 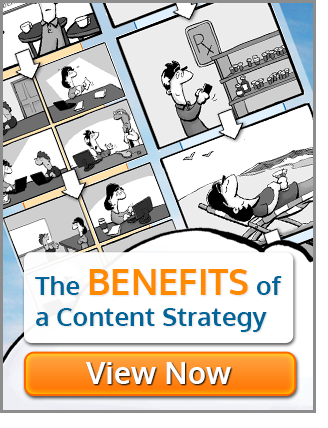 Check out our new comic strip illustrating the benefits of a content strategy. It compares two paths to creating a multi-screen learning experience. One way uses content strategy and results in a quicker, more effective resolution and the other… well, we’re sure you’ll get the point. Follow the story of George as he attempts to increase sales for his company. George is a junior account representative who is tasked by his manager, Marvin, with selling a new, updated product. In the strip on the left, George relays through Marvin that he doesn’t know what or how he needs to be selling to clients. Marvin works with Francine, an L&D professional, to design and publish a new course to the LMS to handle this gap. However, this content is rigidly designed so that it can only be viewable on one device. Every time a new need pops up, it’s basically back to the drawing board (or meeting room). It’s not actually giving George what he needs to sell his product, either. George becomes frustrated with taking multiple courses and not receiving the information he needs in order to do his job better. Francine frantically tries to meet the demands and rework things, but it’s all futile – there is no real strategic thinking behind how the content is created, developed, updated or published. On the right, you’ll see how Francine successfully crafts a content strategy so that the sales features, benefits and comparisons are available to George in multiple formats. He especially loves how the information is available on his mobile device for when he’s selling in the field as opposed to at his desk. At the end of the strip, you’ll be able to download a free chapter of Chad Udell’s Learning Everywhere: How Mobile Content Strategies Are Transforming Training in MP3 and PDF format. The book features ideas and insights on how you can get started using content strategy in your learning design endeavors. Float presented on this topic at the 2013 DevLearn conference in Las Vegas. For more on that presentation, please take a look at the session description and handout here. 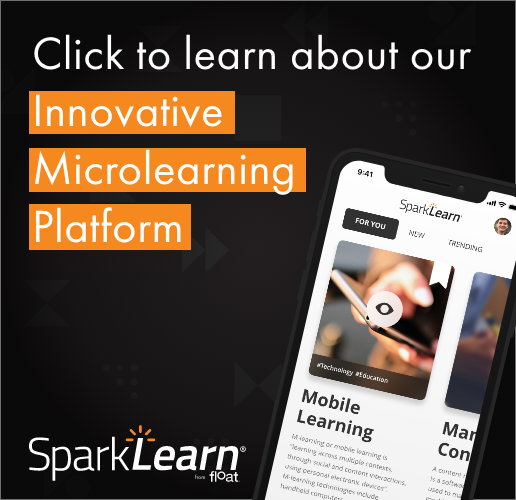 If your organization is looking at developing a content strategy to make your eLearning and training materials available on mobile, contact us to see how we can help you succeed.